‘Tis the season for enjoying holiday leftovers. 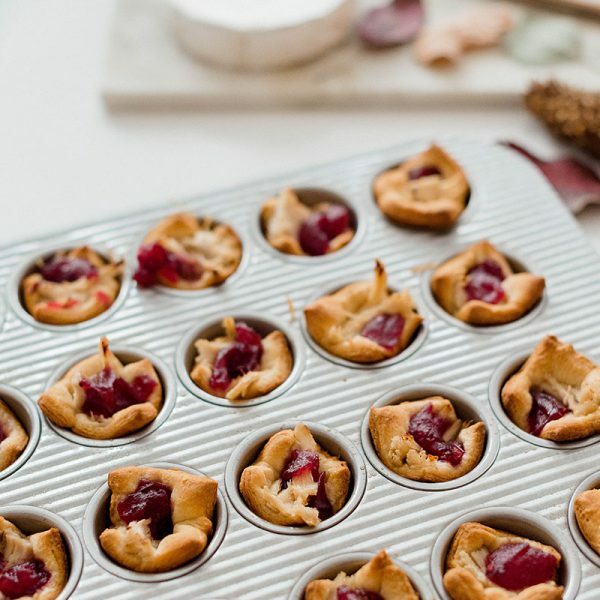 What better way to give your turkey and cranberry sauce new life than cozied up with Brie cheese and nestled in crescent roll dough? These crispy, gooey and tangy bites work well as a gourmet snack or side. They’re sure to impress without stress this holiday season. Did you know South Dakota’s soybean farmers contribute to your holiday feast by growing crops to feed millions of turkeys across the U.S.? Five million turkeys are raised in South Dakota every year, and they love to eat locally grown soybeans. In fact, poultry is the number one consumer of soybean meal in the country because it’s packed with protein and essential amino acids to keep birds healthy as they grow. No leftover turkey? No problem! Other types of poultry will make this recipe soar. Watch the video for instructions and scroll for the full recipe. Brush up on your turkey stats, get tips for safe leftover storage and more recipes ideas here. Preheat oven to 375 F and spray muffin tin with cooking spray. Roll out crescent dough and pinch seams together. Cut into 24 squares. Place squares into muffin tin. Cut Brie into small pieces and place inside crescent dough. Top with a small piece of turkey and a spoonful of cranberry sauce. Bake until crescent pastry is golden, about 15 minutes.